SWPC forecasters use their synoptic maps to view the various characteristics of solar surface at a locked-in time, on a daily basis. They create a snapshot of the features of the Sun each day by drawing the various phenomena they see, including active regions, coronal holes, neutral lines (boundary between magnetic polarities), plages and filaments and prominences. This map is a valuable tool for assessing the conditions on the sun and making the appropriate forecast for those conditions. Active regions are localized magnetic fields on the Sun. Areas with strong or intense magnetic fields provide energy for solar flares and coronal mass ejections (CMEs), so accurate forecasting of space weather activity requires an accurate picture of these regions.. Active regions are given official numbers by SWPC, and the drawings include the probabilities of C, M, and X class flares for the next 24 hours associated with each active region, along with a proton event probability. Coronal holes are single polarity magnetic regions that are the source of high speed solar winds which drive magnetospheric activity. Coronal holes are the most common cause of geomagnetic storms. Coronal holes have historically been identified from He I 10830A ground-based observations. The boundaries of coronal holes are shown on the synoptic drawings as lines with hash marks on the coronal hole side of the boundary line. Large magnetic field structures of one magnetic polarity have a ‘neutral line’ at the boundary of the different magnetic polarities of the fields. Neutral lines are associated with flaring in active regions, and filaments/prominences are often associated with the neutral lines on a quiet sun. Neutral lines appear as dashed lines on the synoptic drawings and the forecaster indicates the polarity of the magnetic field on either side of the neutral line with + (positive) and – (negative) signs. Plages make up most of an Active Region, and appear bright in conjunction with the dark sunspots. Plages have strong magnetic fields but disorganized magnetic fields, unlike the highly organized fields of sunspots. In the synoptic drawings, plages are colored red. It is quite normal to have regions of plage with no sunspots, which do not receive an official number since they are not considered active regions and are unlikely to produce solar flares. Plage regions are the chief source of UV variability from the sun, however. Highly-stable regions of high density gas in the low density corona are called filaments. When these occur near the limb and can be seen protruding from the corona, often in spectacular fashion, they are called prominences. When they erupt they can be a geomagnetic storm threat, but the eruptions are usually slow and don’t often drive large storms. The filaments and prominences are drawn as outlines with hash marks. Lt: The current Carrington longitude line (north to south) at solar center disk. Bt: Referred to as the B-angle. The angle measured from the current position of Earth within its tilted (inclined) orbit, compared to the Sun’s equator. It ranges between + or – 7.23 degrees. Pt: Referred to as the position angle. Essentially, the current angle between Earth’s geocentric north pole and the Sun’s rotational north pole. The range is between + or – 26.31 degrees. Returning Carringtons: Refers to the next 3 days of returning Carrington longitude lines to the east limb of the Sun. Spot groups are labeled with their assigned NOAA SWPC number. Underneath that number are four probability numbers (from 1 to 100 %) for C-class flares, M-class flares, X-class flares, and energetic proton events. Synoptic maps of the solar surface are drawn each day by SWPC forecasters, providing forecasters with a broad outline of solar surface features. These maps were started on June 2, 1972 and have been produced daily since then. They show neutral lines, coronal hole boundaries, active regions, plages, filaments and prominences. The maps also have information about coronal hole polarity, list active region numbers, and have flare and proton event probabilities for each region. The historical synoptic maps are available at NGDC. 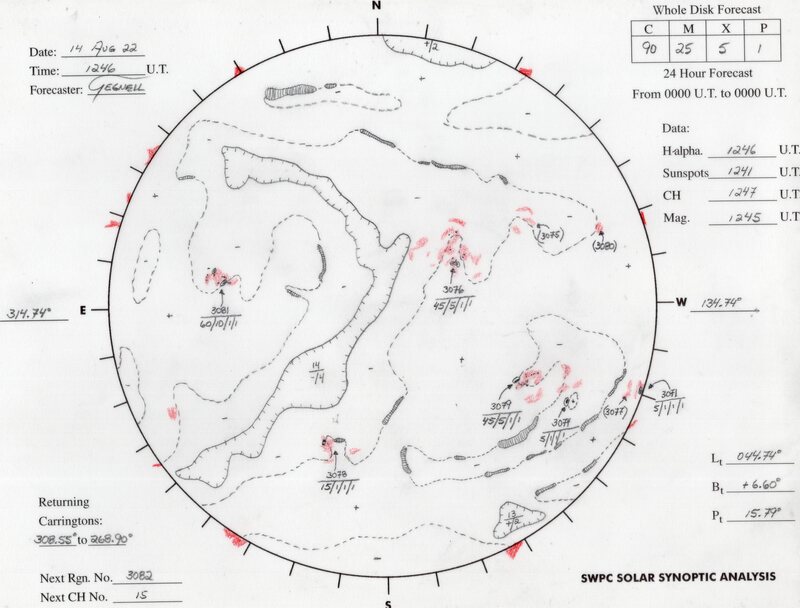 The official archive of Solar Synoptic maps (going back to 1972) is available from NGDC. An archive of recent SWPC Solar Synoptic Analysis maps is available via ftp.